Just last week, a guy who's been hanging around with our riding club asked if I would still ride with the club if I bought a sportbike. "Of course I'm going to still ride with the club," I said. "Will you still ride with me?" He asked that because while we were at a local motorcycle dealer, I could not take my eyes off of a Yamaha FZ6. I told him that I was giving that bike some serious consideration. I don't know if he was joking with his question or not, because he kept a straight face. But I thought it was an interesting question. Interesting because it shows there's clearly a social divide within the greater motorcycle community between sportbike riders and cruiser riders. They're like rival camps. Throughout cruiser forums and blogs, I've noticed people blaming the younger and more daring sportbike riders for giving all motorcyclists a reputation for being dangerous and stupid. But equally as well, people on sportbike forums and blogs blame the older, more feeble, cruiser riders for not knowing how to handle 800lbs of steel and putting other riders in danger. In a way, it's almost like Democrats and Republicans; at an early point in your life you pick a direction to go in, and you throw your loyalty to it and blame "the other side" for creating all the problems. But we're all motorcycle riders, just like we're all Americans, and we all love our freedom to ride, whatever "riding" means to you. So lately, I've had my eye on the Yamaha FZ6 pictured above. Technically, it's not a sportbike, it's a standard, when you consider the more upright riding position, and a gearing designed more for commuting than for racing. But it has sport styling, so it's often confused for a sportbike. But kid you not, these bikes perform very well in the twisties, much better than my Harley-Davidson Ultra Classic, and better than my Yamaha Road Star. And with 98 peak horsepower, and a light 459 pound aluminum construction, it'll carry me around quite easily. And then a brand new one is priced at only $7,000. How can I resist? One of my other buddies is totally in support of me buying this. He's a cruiser rider also, but understands the need to carve canyons evermore efficiently. Just this morning, he called me up about a used FZ6 at North County House of Motorcycles, and offered to meet me there because that dealer lets people test ride used bikes. I am very tempted. But seriously, I can't throw down money for another bike right now. First, I'd have to sell the Road Star, and I know that bike will only fetch me $3-4K, and I'd still have to dig into my bank account for the rest. I'm carrying a second mortgage that I really need to get rid of, and I've been nagging my wife about toning down her spending. If anything, maybe towards the end of the year I'll revisit this. 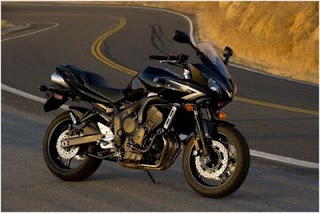 You might be interested in a related FZ6 article I posted yesterday on Biker News Online (link). Try riding an enduro, like my Suzuki DR650. Hell, we don't fit in anywhere. Nary a low wave from a cruiser or the sport bikes. We're the misfits of the biker world. Not that I'm complaining, mind you. When I get distraught about it, I just go off road for a while. FZ6 is a good bike. You'd need to keep the RPMs high though. And you'd probably soon realize that it is underpowered and would want to upgrade to something more powerful anyway. My 2cents - look into sport-touring bikes like Triumph Sprint, Aprilia Futura, Ducati Multistrada and Honda VFR. They all have a sport bike look and feel with a comfort of a long distance touring bike. Also adventure bikes are something to look at, namely the newer Triumph Tiger. Adventure bikes would look less sporty though. All of these bikes are obviously more expensive if you want them brand new. However for 7K I am sure you'd be able to find really good deals for used ones in great shape. If I had spare cash, I would bring home an Enduro. Would love a DR or KDX. Next thing you know I'm taking the short cut to work through the woods. Then I would be planning a trek across Africa and who knows where this fantasy would take me. I wish I were a RUB with some extra coin for a new toy. I'm just a poor HOG with one bike. Wo is me. I think an open dynamic might be a good thing. I am married to my Hawk GT, but I'm allowed to date other bikes.